I always loved to dance. By age eleven, I convinced my parents to let me take dance lessons. My father insisted that I take from a male teacher and that it had to be a ballet/tap combination because he was afraid I would turn out gay. That was surprising because I had already come out gay to them when I was nine years old. Regardless, I began my training with Jon Zerby (father of the actress Kim Darby whose original name was Derby Zerby) at a dance studio in North Hollywood. After a few years, I auditioned for a local classical ballet school/company in Burbank and was offered a full scholarship. Having seen Romeo and Juliet with Margot Fonteyn and Rudolph Nureyev, I desperately wanted to dance classical ballet. I was sixteen years old and able to drive so I could take classes seven days a week. I took lessons and danced with the classical school for about seven years. 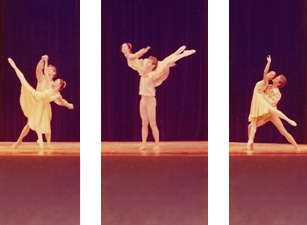 Although their goal was to launch a classical ballet company in Los Angeles, it never happened and I went on my own. In some ways, I was already too old for many dance jobs but I did get some. By my late twenties, it was obvious that jobs were going to younger guys so I retired from dance to work as an engineer. Unfortunately, the engineering world was not ready for an openly gay worker and it did not go well. By my mid thirties, I took up ballet again and opened my own dance school and Capezio dancewear store in Redding California. Again, and unfortunately, after a few years anti-gay forces in Redding destroyed the business and I left the ballet world in my late thirties. Still having the desire to dance, I took up ballroom and country dancing in my mid-forties and founded a Los Angeles based same-gender dance troupe that performed all over Southern California. Below is a summary listing of my prominent dance experiences from most recent all the way back to my teens. I hope you enjoy. I founded and directed the world’s only same-gender couple dance troupe of 18 dancers who performed at every gay pride event and rodeo in Southern California and Nevada. The goal was to expose the LGBT community to the delights of ballroom dancing and to normalize LGBT people to the non-gay community. The troupe performed the waltz, cha cha, west coast swing, east coast swing, tango, meringue, hustle, and western two-step in fully choreographed and costumed numbers. ODB also performed on a cruise liner for audiences of 900 (mostly straight) people who whooped and hollered in fun to the numbers (although a few people walked out in disgust). It was fun but hard work when you consider that in ballroom dancing the leader and followers do different steps and the orientation of many of the steps changes depending where you are located on stage. Thus, you can’t just teach the same exact step to all dancers. Click here for photos, videos and more about Out Dancing Ballroom. Owner-Manager school of dance school and Capezio dance wear retail store. I taught ballet and traditional jazz. Other teachers were hired to teach hip-hop, aerobics, belly dancing, and ballroom dancing. Formed and directed 501(c)3 non-profit regional dance company—Redding Dance Theater. Published quarterly dance publication—Gotta Dance. Wrote entire bookkeeping computer programs for the business utilizing Microsoft Excel. Produced, choreographed, and performed a regional California Miss America Pageant (1988). I truly enjoyed creating the dance studio and teaching classes. Market research revealed that Redding could easily accommodate a third dance studio and there was no dancewear supply store. I designed the studio in an art-deco style with imported vinyl flooring, two permanently mounted video cameras to allow students to record their lesson, and continually showed ballet videos on the four televisions mounted in the store and waiting areas. After just 2 years after the studio and Capezio store opened I was breaking even. However, two problems occurred. The subflooring began to soften and the landlord simply filled the holes with cement. The floor became un-danceable. Also, I came down with hepatitis B (from my acupuncturist) and was sick for a month. Although the employees continued operating the store and I had teachers cover for me, the other dance studios in town spread the rumor that I had AIDS. I threatened the other teachers and the community college to stop spreading the lies but it was too late. No children showed up for class and sales at the retail store dropped to zero. This was in the late ‘80s and there was great fear of AIDS. People were willing to drive 2 hours to San Francisco or Sacramento for their dance supplies instead of buying them at the only store in town. They were afraid that I would sweat on their child and the merchandise in the store was tainted with the virus. As a private business, I could not force people to buy dancewear from me or attend classes. Three months of zero sales and discouraging reports from the only two adult students to return made it obvious that the business was doomed. Reluctantly, I closed both the studio and dancewear store in 1990. Click here to read past issues of Gotta Dance, see photos of the studio construction and opening, and photos from the Miss American rehearsal. Principal dancer. Company worked in conjunction with Paramount Studios to provide ballets for laser disks of classical music. Company was founded and run by Paul Shipton and Ralph Ziegler with Goldie Hawn on the board of directors and El Gabriel as primary choreographer. This was one of my best dance experiences. I felt the choreography was inspired. Guest dancer with many ballet companies across the U.S. including performing as the Cavalier in the Nutcracker pas de deux for CBS. Taught pas de deux at Joffrey Ballet in the summer of 1979, and worked at the MGM in Hooray for Hollywood. Click here to see photos and video. Principal dancer and business manager. 501(c)3 California non-profit corporation. Company of 16 dancers. Also helped secured funding and coordinate tours. After years of struggle, the company closed soon after I left. Over the years I have written a number of articles pertaining to dance. You are welcome to download these and use them in a classroom setting. Directing a Dance Troupe and Choreography Tips Download for Free! Why Boys Don’t Dance Download for Free! Gotta Dance! Articles Download for Free! Ballet Cults: Every Parent’s Worry Download for Free! I belonged to a ballet cult. I know that seems to be a strange combination of words but, in all honesty, that is what I participated in during my training years as a ballet dancer. Whether or not it was something inherent in me that allowed the tangle of lies and self-denial, or the manipulation by the cult, the experience created lasting impressions on my life. I have found that it significantly impacted all of us who went through the same experience. In my career as a professional ballet dancer, I met many dancers who also came from cults. They told tales of intrigue, lies, psychological manipulation, social isolation, and sometime sexual abuse and more. I found ballet and dance cults in every city I visited. I found a trail of damaged lives. The Ballet Cult Project wants to collect stories from dancers all over the United States detailing their cultic experience. If sufficient stories are collected, perhaps a publisher could be found to bring this important information to the public. You can participate! Come share your story! For more details and article, click here. In the 1970s and early 1980s, I manufactured a foot prosthetic that gave the illusion that a foot pointed better than it really did. I had lousy looking feet. They would point straight but not bend slightly over in the desired curve. Ballet classes seven days a week for decades, putting all my weight on the top of my foot to try and bend it over, and more did nothing. Regardless of teachers’ claim they can form your body into anything, it is not true. Each of us has a genetic disposition that limits how far the body will bend. Some dancers feet will not curve over into the desired shape regardless of how much effort or desire they have. Below is a photograph of the desired bend in a ballet dancer’s foot. The next photo shows a foot being stretched. I made a prosthetic that slipped over the foot putting a layer of rubber at the top of the foot. When the foot pointed, a bump showed that gave the impression the foot was curving more than it could. Before I made Foot Points, many of us dancers resorted to cutting up women bras for the cushion cup to cut to shape and tape to the top of the foot. I sold hundreds of these to appreciative dancers who were frustrated by their feet. I never really made any money with these and ceased production in the mid-1980s. Many dancers wrote to me to beg me to keep making them. Often my friends jokingly referred to Foot Points as “Foot Falsies.” There are a number of companies that now make a similar device such as ‘Fake Arch’ shown below. Guess I was ahead of my time.